Eric Merz, under his Mokkograd label, presents Splinter Zone, an endless Mega Man-inspired action platformer. The game features 36 procedurally arranged levels and six boss encounters, with level themes including futuristic cities, conveyor belt-filled factories, underwater areas, and frozen ice-scapes. 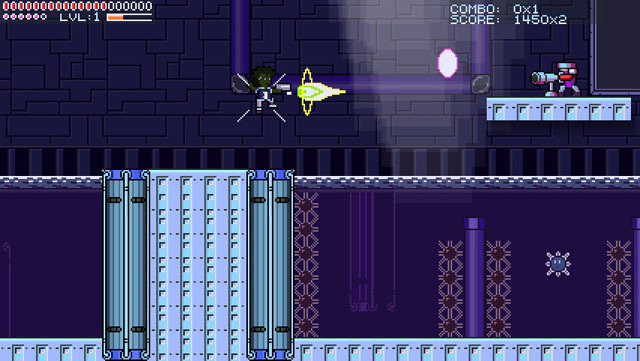 The player earns experience points by shooting enemies, and each new level increases his firepower with hovering orbs that follow closely behind... but the game is tough, and taking a hit causes the player to lose a level, and getting killed sends him back to the start of the game. For players wishing to even the odds a bit, a cheat menu loads up at the start of each game, allowing players to increase their damage output, decrease damage taken, and even remove the need to reload.